Here's a quick video that explains how Private Equity firms work, with fun pictures that make it easy to understand. When I saw this I said, "That is EXACTLY what happened to my dad!" For 32 years my father worked at Armco Steel and going to work every day, sometimes 18 hour days, 7 days a week, gave him a small hint of what it might be like in Hell. He wore top-to-bottom thermal underwear underneath heavy fire retardant coveralls, on top of which went a "silver suit" and of course a hard-hat, and he poured steel that reached temperatures of 3,000+ degrees. Generally the temperature in his working environs was around 130-145 degrees. In spite of all the protective wear, he left the house every day with the knowledge that he would get burned that day. Every day. The thermal underwear was necessary to make him sweat, which strangely helped cool him down. To counteract this, the workers were on a steady diet of salt tablets. Of the 110 or so men that worked in the area he did, four were killed the first four years he worked there. A death a year was pretty much average, people burned to death, dying from falls, and several fatal injuries that are too gruesome to mention here. The reward for all this terrible, hard work was a living wage, enough to give his children a middle-class lifestyle, and just as important was the promise of security in his Golden Years. He faithfully paid into the pension fund, and was promised quality health care for the rest of his life. Fast forward to 1992/93: Bain Capital, headed by Mitt Romney, for whatever reason, decided that the steel plant where my father worked would be a good investment. The effects were felt immediatly, with lay-offs, wage cuts, benefit cuts, etc., just like it shows in the video above. Then Bain borrowed $100,000,000 (a hundred million) against the company, renamed GST, and crippled with that debt a steel mill that had been in existence since 1888 went bankrupt. My father retired in 1997, so he wasn't one of the 750 hard working laborers that were thrown out on the street without a job, but as a result of the bankruptcy his pension was cut in half, and he lost all of his health care benefits. Add to this the fact that his liver was riddled with pockets of steel (they thought he had liver cancer... no, it was solid steel that had leeched through his skin over the years and settled in his organs) and other health problems, he found himself in his late-50s with pre-existing conditions and no health insurance. That kept my mother in the workforce much longer than she should have been, so that they could have the health care that working in a steel mill for more than 30 years was supposed to provide them for the rest of their lives. At this point, you may be thinking, "Boo hoo. Not my problem." Well, if you're an American taxpayer, this is where you come in. 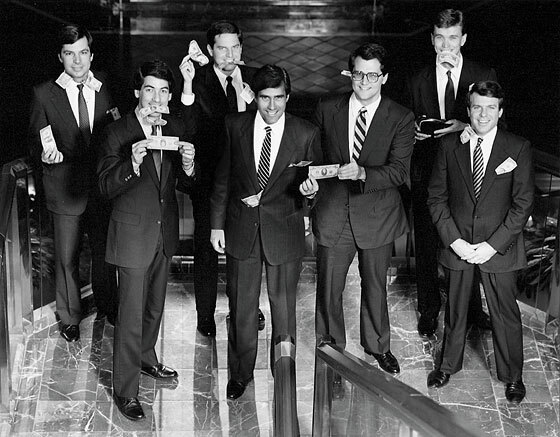 Bain Capital made at least 36 million dollars over those years, and $900,000 a year for "consulting fees". Time and again Bain was warned that the pension fund was in danger of a shortfall, but they took no action, and after they walked away with all the dough, the federal government had to cough up 44 million dollars to bail out the pension fund. And this is just one of many such stories where Romney's Bain made millions of dollars on an investment, and then stuck the taxpayers with many, many millions more dollars to pay the guaranteed pensions of the workers of the companies they gutted. See the video above. So the next time you see this picture of Mitt Romney and his fat-cat cronies with money in their mouths, remember that the day that picture was taken my father was probably sweltering in a hell-hole, getting burned, and risking his life for financial security in his Golden Years that was stolen from him by these very men.